I was delighted to receive a book in the post recently, all the way from Norway. It all started when I stumbled upon a gallery of cartoons on Instagram belonging to Jade Nordahl. I found them absolutely hilarious, so I messaged her and asked if I could interview her. Well, of course she said yes, you don't say no to a guy wearing a dinosaur costume as his profile picture. Who in their right mind would do that?! This Norwegian Cartoonist Encapsulates Perfectly What it's Like to be a New Mother. Signed book! "To Harry / Dad's Diary thanks for the support, keep on blogging." Seriously, go have a look at that Buzzfeed post, it's like a total car crash course in parenting, the cartoons are brutally honest and everything is so recognisable. Jade, tell me about your family. We live in Oslo! My husband is Andreas, Abel our son was two years old in June and Abbey the dog is three in August. The name @ab.bel on Instagram is short for Abbey and Abel. What inspired you to start doing the cartoons? I've always enjoyed drawing, painting, and whenever there is a pen in my hand I end up drawing something. That's how the whole Ab & Bel project started. In Norway, we get to stay home with the baby for close to a year. In the evenings, when Andreas was home from work and Abel slept, I realised how therapeutic it was for me to draw humorous versions of those frustrating situations. I was so exhausted those first few months of maternity leave. I thought maybe I can help some other tired mommies and daddies out there! It's easier to handle everything when you're sharing the frustrations and laughing together. So I started posting my drawings on Instagram, the audience grew, and I got a book deal, yay! What were you doing before Abel was born? I work for the Norwegian Broadcasting Corporation, NRK (it's the state broadcaster, our equivalent to the BBC). I'm in corporate communications, so my drawings have nothing to do with the day job! Jade at work, looking slightly less bedraggled. What are your favourite drawings? I have to mention two! 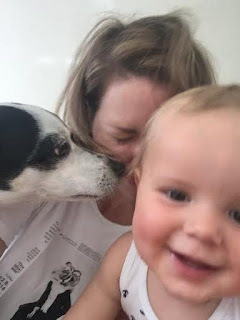 One of the very first I published, called 'Livet' (life, or life 2.0), with me totally exhausted, baby Abel on the floor, with Abbey the dog licking his face. That's how I felt during those first months. The second one is called 'Bedtime Stories', where I sit with my toddler on my lap, trying to get him to sleep by telling him stories of stars and tractors, and love and life, and he replies, "Banana." I think the two illustrations kind of sum up this project, from tired and stressed newbie to experienced mom, from fussy baby to curious toddler. The things that matter the most in life right now are tractors, dogs and bananas. Hilarious! I can relate, my son is obsessed with tractors and there's a programme he watches here called Tractor Ted. It's just footage of life on a farm and loads of tractors and it pains me to say it, but I love it. It's relaxing. I'd better not show my son that! Are you going to do any drawings about it? I don't want to give that tractor any more publicity. Ha! What's next for Ab & Bel? I don't know, time will tell! Finally, what would your advice be to new mums who are finding parenting difficult? Well, I may be 'experienced' in taking care of my own boy, but not parenting in general. The most important lesson I've learned is that being a mom is way more exhausting than I could ever have imagined, but I can handle way more than I think I can. A tip to pass on would be to try to see the humour in things. Laugh together and talk to others in the same situation. I found that very helpful! Thanks Jade, and for your impeccable English too. Best of luck with everything! I love feelgood stories where someone discovers they have a hidden talent and it skyrockets from there. The book,‘Et år i ammetåka’, published by Spartacus, is only available in Norway so far, but I'm sure you'll start seeing it around the rest of the world soon. You can follow Jade on Instagram here, or you can type in her username, ab.bel, if you have the app installed on your phone. *And finally, a shameless plug: if you live in Norway and would like to offer me an expensive cardigan or free holiday (yes please, I can dream!) or would like me to write something for you then don't be shy, send an email to dadsdiaryblog at gmail.com! Enjoyed this? Please share this post, and subscribe to my blog on Facebook! I also like this book. There is so much to learn in it. Thanks to the author for the inspiration and good stories! When I need to write my english paper I draw inspiration from such authors. Kids, who read such books, will grow up kind and sympathetic!